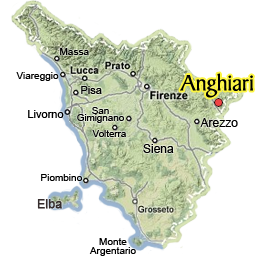 Anghiari is about 30 km from Arezzo, near the border between Tuscany and Umbria in the Tuscan Valtiberina valley. Anghiari is a small medieval jewel set on a hill made of stone built up over the centuries from the Tiber River at its feet. Thanks to its strategical position, Anghiari played an important role in the Middle Ages. The flat valley underneath the village was the set of the famous Battle of Anghiari in 1440, when Florentine troops won the battle against the army from Milano. The legendary fresco depicting the "Battle of Anghiari" by Leonardo da Vinci in Florence's Palazzo Vecchio's Salone dei Cinquecento, unfortunately lost shortly after it was painted, was commissioned to celebrate this victory. Anghiari, a characteristic village enclosed in massive 13th century walls, preserves the ancient and original atmosphere of small medieval towns. Walking around its narrow streets, you can breathe the air of its history and glory. The stone houses overlooking the streets have small windows, wooden shutters and doors, sometimes damaged or broken, but still characteristic. The entrances and balconies of the houses are often decorated with flowers which color the narrow streets of Anghiari, making it more beautiful and charming. Anghiari is considered one of the "most beautiful villages in Italy" with an Orange Flag distinction by the Italian Touring Club, a "medieval treasure lying between the Arno and Tiber" (as you can read on the official tourism website). If you are planning a visit to Arezzo or this area of Tuscany, we strongly recommend you stop in Anghiari! As you tour Tuscany, you are drawn into its history; the twists & turns that shaped its landscape, politics & personality. Anghiari is the perfect example of a small town which left a large mark - large enough to be captured by artists like Leonardo da Vinci. Read here to discover the story.